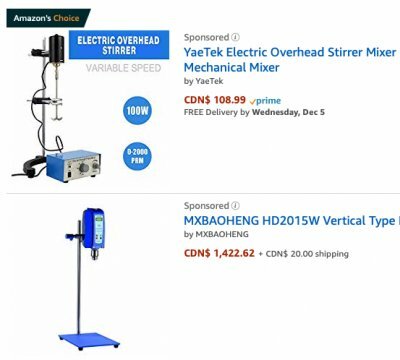 An important, even essential tool in ceramic labs, studios and classrooms for mixing test and production slurries (body and glaze) is a good propeller mixer. Particles in ceramic powders can be exceptionally small (and often agglomerated) and wetting all their surfaces requires the injection of energy into a slurry that only a device such as this can do (either by sheer energy or by extended mixing times). This is especially important when the slurry is deflocculated and thus has a low water content. In addition, slurries get lumpy during use, a good mixer with a propeller is needed to smooth them back out. For mixing glazes and casting slips a mounted, hands free mixer that can run for hours at the desired speed is much better than a hand-held device, especially so if it has a good propeller. This is for one special reason: Observability. 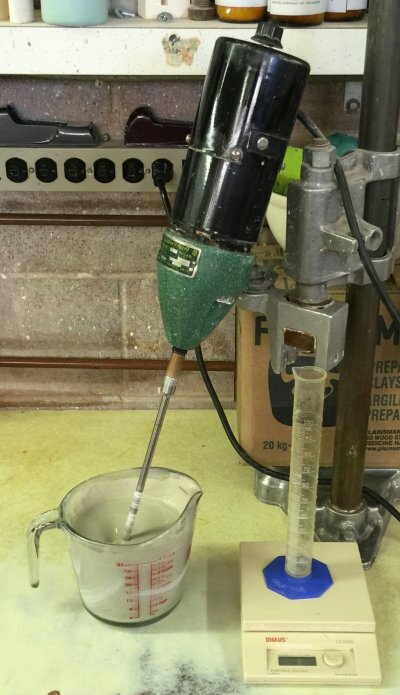 Ceramic slurries often need carefully balanced rheologies (where you are fine tuning specific gravity, viscosity and thixotropy). An important tool in achieving that is being able to observe changes in the way the moving slurry behaves as you add things. Being able to adjust the angle and speed of the mixer shaft such that maximum energy is being injected but without sucking any air bubbles is very important. At this state the behaviour of the slurry is very sensitive to changes, especially with deflocculants. For example, if nothing changes when some deflocculant is added you will know the slurry is over deflocculated. Even changes in the texture and reflectivity of the surface become evident. Another capability a mounted mixer presents is being able to shut off the mixer and watch the behaviour as the slurry comes to a stop (e.g. a thixotropic glaze should stop in a few seconds and bounce back slightly). Or, being able to slow it down and observe if the edges stop motion while the centre continues (indicative of too little deflocculant). 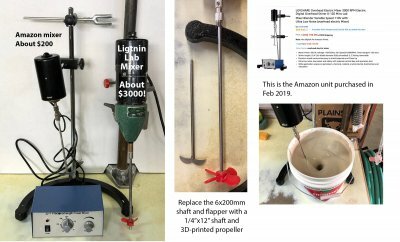 You should have a table-top model for mixing small test batches of a litre to a couple of gallons (a 1/20hp Lightnin mixer is about the right size). A floor model for mixing larger amounts (e.g. 3-5 gallons) is also important (around 1/3 to 1/4hp motor). You can make your own large mixer inexpensively. However such mixers must be treated with respect, they are potentially dangerous and can inflict serious injury if not used carefully. You can buy table-top ones on Amazon (for $hundreds) or from laboratory supply companies (for $thousands). It is important to have a good mounting system that enables leaving the mixer running for a period of time (minutes to hours). The mount should offer good control over vertical position and angle of the shaft (adjustment of these parameters enables mixing at maximum RPM without sucking air bubbles into the slurry). This is a heavy-duty unit, home made, with a 1/3 hp motor. It that can handle 5 gallons of high density suspension glaze or body slurry. You need variable speed (not constant speed). Although some have timers these are not useful. The prices range from $100 to $thousands. They do not always come with the shaft and propeller (but it is easy to get a stainless steel shaft). A table-top device may be rated at 20L capacity, for example, but that is for thin liquids. For thick ceramic slurries it likely will only handle 8-10L (if the propeller is suitable). Question the RPM rating, the cheap mixers use stepper motors (they require minimal electronics) and only get a fraction of the claimed RPM. These will only be useful with a large propellor having steeply pitched blades. Buying a propeller is not practical because one will likely cost more than the mixer, be the wrong pitch, wrong direction, wrong size. 3D-printing one yourself is the best way (keep reprinting until it works well). If the shipping weight of the package is 15-20 lbs much of that will be the heavy metal base. If you are at all serious about testing glazes and clay bodies, you need one of these. There are other methods, but nothing else comes close to this. It is the most valuable and frequently used tool in any ceramic bodies and glazes testing lab or classroom. These are expensive new, this Lightnin 1/20 hp variable speed cost more than $1000 many years ago, now it could be $4000! But you can get them used on ebay.com. I adapted a mount (to give it vertical adjustment) from a hardware store. 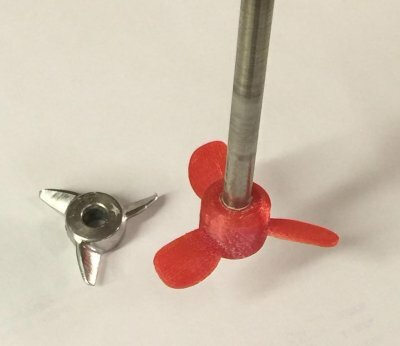 Propellers are also expensive, but you can design and 3D print them yourself or have them printed at a place like shapeways.com. Here is how I print a propeller for my mixer. I have already drawn it using Fusion 360. The process involved choosing Make -> 3D Print, then selecting the propeller and clicking OK. This hands it off to Simplify 3D, the software that actually runs the printer. 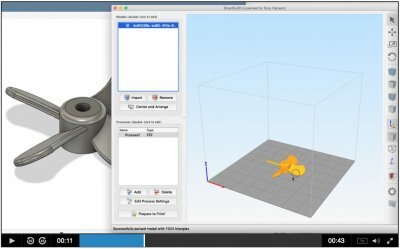 Within Simplify 3D I can position it on the bed and move a slider to animate how the printing will be done, layer-by-layer. Finally, after making sure it is connected to the printer, I click to initiate. That begins the process of preheating the printing bed and head, which takes about 5 minutes. After that, the actual printing takes about 10 minutes.